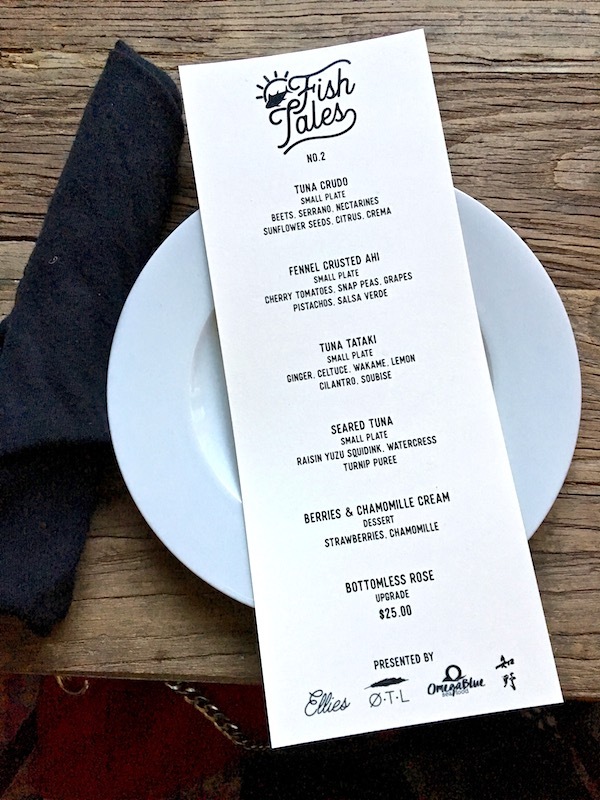 Join Feastly for a unique communal pop-up dinner like the recent Fish Tales in Los Angeles where they broke down a whole tuna and served a 6 course tuna-tasting menu. There were about 50 of us gathered in a Venice townhouse when the guest of honor arrived. 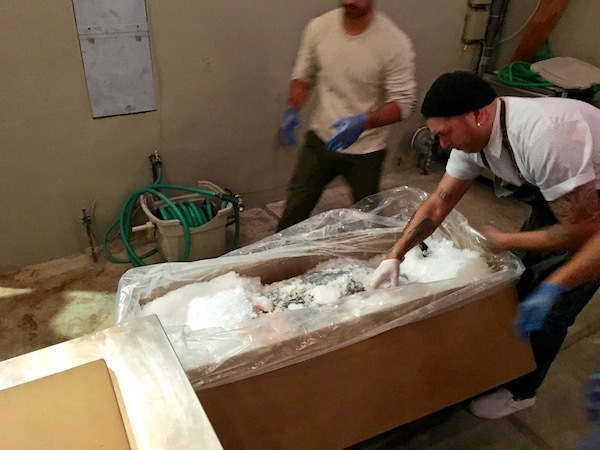 Three guys wheeled in a sealed, ice-packed wooden crate and the crowd formed an instantaneous semi-circle around it as the top of the box was removed. The grand reveal showcased a fully in tact, 180 pound bluefin tuna. Over the next 3 hours, the tuna was broken down and served in a 6 course tasting menu as part of Feastly's Fish Tales dinner. I'm all about sourcing, wanting to ensure my ingredients are as local as possible and produced as humanely and sustainably as possible. This is what brought me to the Fish Tales dinner, organized by Feastly and sponsored by Omega Blue Seafood. 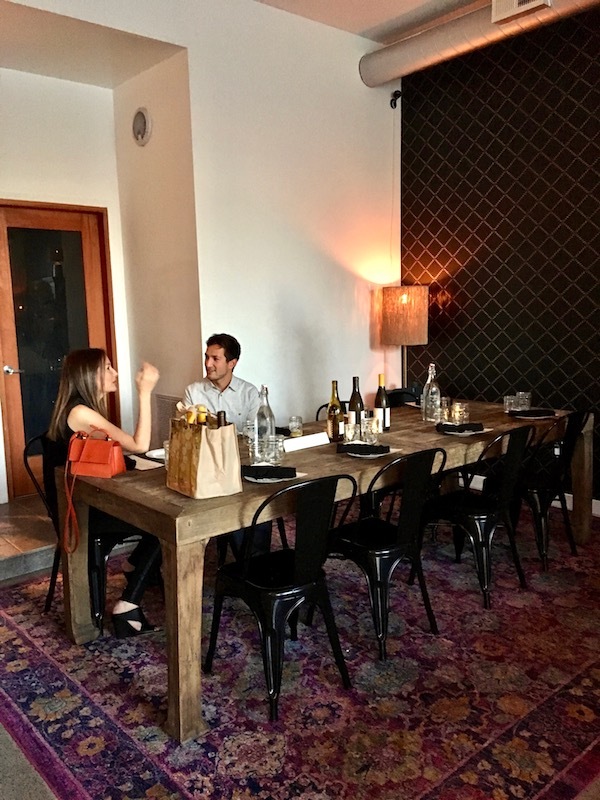 Feastly is a relatively new dinner pop-up experience in Los Angeles. They're also offering meals in Washington DC, San Francisco, Chicago, New York and Portland. In LA, they have a townhouse in Venice and one in the Arts District Downtown where they host rotating dining experiences. Different chefs offer unique meals that include a wide range of ethnic cooking, preparation, dinners, brunches, vegan, vegetarian and full-on carnivore dishes. You dine at communal tables with other food enthusiasts, so you get a side of sociability with an open-kitchen dining experience. My first Feastly experience brings us back to the tuna crate from my "Tuna Tales" dinner. 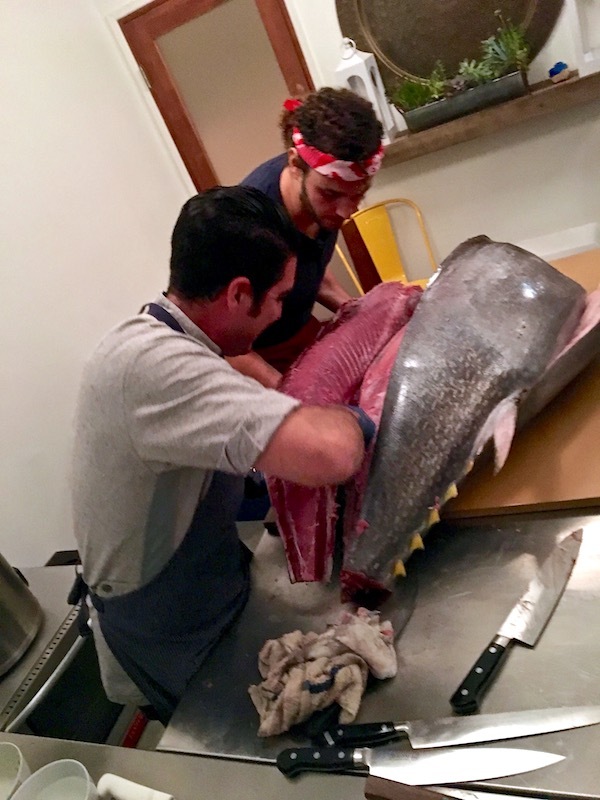 There was a large staff of well-regarded chefs and butchers who broke down the massive bluefin tuna with ease and swiftness as we learned about the tuna. The tuna was provided by Omega Blue Seafood, a resourceful company offering local sustainable fish. Their Baja Kanpachi grows in the nearby Pacific Ocean in La Paz through closely monitored, organic farming. Farming can be a controversial topic as there are many producers who are just looking for a quick buck so they'll often take short cuts to fatten up their products using low quality, non-organic, GMO-produced food. Omega Blue Seafood cuts no corners. Their tuna is never given antibiotics or hormones and they only rely on organic sustainable feed, which primarily includes sardines, you know, fish food! Sustainability is a huge issue when it comes to tuna. The water is being over-fished, and we can't stop eating our spicy tuna, so the tuna supply is dwindling. This leads to either fish being pulled too early to eat to keep up with the demand, or the fish is being quickly fattened up with chemical-laden feed. Omega Blue is carefully monitoring the process which ensures a nutrient-dense product that is ethically harvested. The gentle harvesting means a better tasting tuna. I was able to confirm that statement many times over as I tasted 6 different tuna preparations throughout the night. They eased us in gently with nigiri and hand rolls, appropriately whetting our tuna appetite. Then came more and more unique dishes like tuna crudo with beets, serrano peppers, nectarines, sunflower seeds and citrus. With the open kitchen and ability to wander throughout the house, you can watch your dish come together right before you eat it. Fennel crusted ahi was an explosion of fabulous flavors with a punchy salsa verde, cherry tomatoes, snap peas, grapes and pistachios. That dish needs to be on a menu somewhere so I can eat it on a regular basis. Once is not going to be enough. I'd also like to eat the tuna tataki again, and again. Gentle flavors of ginger, celtuce, wakame seaweed, lemon and cilantro are nicely balanced with a creamy soubise. The final main dish was a seared tuna with savory raisin yuzu squid ink sauce. Yup, never put those words together in a sentence before. The turnip puree gave it a warm, creamy bed to add to the mix. While I loved all of the tuna throughout the night, I was happy to see that dessert did not contain any. It did feature the most beautiful, ruby red strawberries from a local farm with a chamomille cream that had just the right level of sweetness to balance the berries. 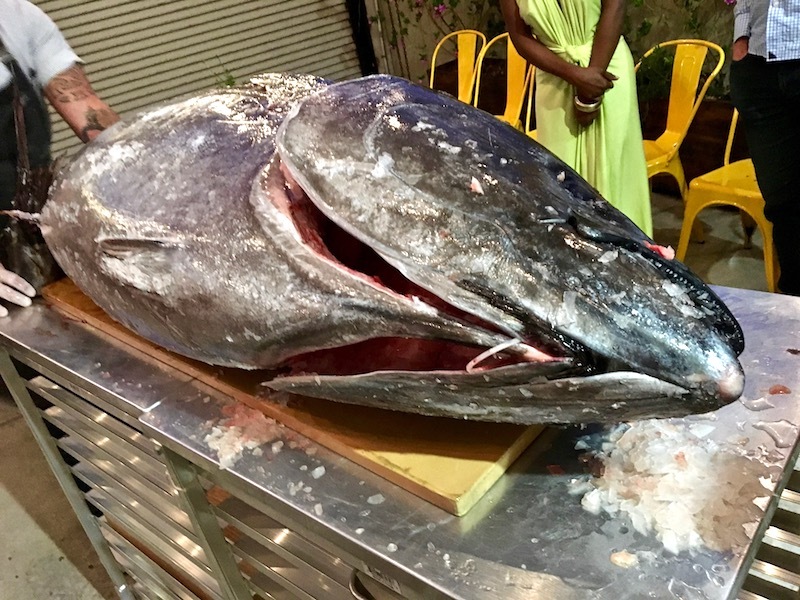 The Feastly Fish Tales dinner that I enjoyed was the second time the fabulous tuna dinner was offered, so check out Feastly to see if it might be coming again near you. Or just peruse the selection of interesting dinners to find a meal to upgrade your next evening out. I also have a special offer of $10 off your first Feastly meal when you click here. Enjoy!